This chapter describes a multi-phased, sociocultural model of teacher professional learning that emerged from the findings of a descriptive phenomenological study. The aim of the study was to better understand the complex sociocultural learning process involved in the development of teaching practice for mid-career post-secondary teachers. In post-secondary institutions, increased demand for enhanced teaching and learning practices has led to growth in educational development, a field that supports professional learning related to ongoing development in teaching. Sociocultural research now needs to inform the design of educational development approaches, particularly as it relates to teachers’ authentic experiences of development in teaching. The model, that was the product of that inquiry, comprises a four phase developmental process that includes: (i) a catalyst phase; (ii) an idea development phase; (iii) an implementation phase, and (iv) an outcomes phase. The nature of each phase is explored through discussions of the individual, social, and contextual dimensions as well as interrelationships between these dimensions. 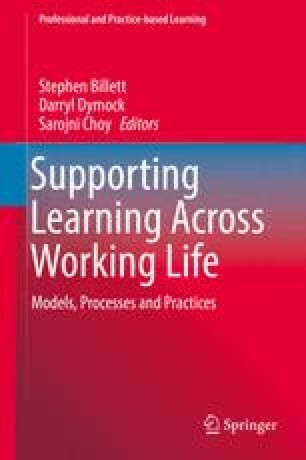 Using Billett’s sociocultural theory of co-participation, learning in each phase is examined as the interrelationship between individual intentionality and workplace participatory practices. Educational development approaches are then considered through the lens of the proposed model as it provides an empirical foundation for a sociocultural approach to supporting post-secondary teacher professional learning.